Francesco Ciccozzi appears in the Painesville, Ohio, area between 1914 and 1917. In America, Francesco Ciccozzi was known as Frank Ciccozzi. Francesco Ciccozzi was born on April 15, 1890, at Italy. He immigrated to the United States on September 25, 1914, at age 24. 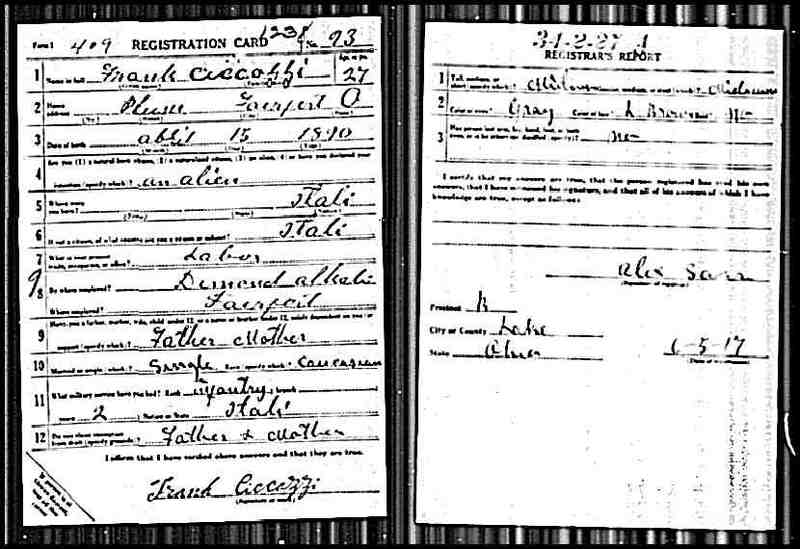 Francesco Ciccozzi registered for the World War I Draft on June 5, 1917. He was living at Plum Street, Fairport Harbor, Lake County, Ohio. Francesco was employed by the Diamond Alkali Company. Francesco Ciccozzi’s place of birth is not known.